NBS Amyloglucosidase 300 Enzyme helps to increase the fermentability of wort. This product is ideal to use for the production of highly attenuated low carbohydrate beers. Amyloglucosidase 300 is derived from a selected strain of Aspergillus sp. and helps to increase the fermentability of wort. This product is ideal to use for the production of highly attenuated low carbohydrate beers. This enzyme is used to produce glucose, starting from the non-reducing ends of starch chains and dextrins. In brewing the result of enzymic action is the increase of the fermentability of wort. α-Amylase side activity in this product will also very slowly hydrolyse 1,6 α-glucosidic linkages. There are also very small quantities present of transglucosidase and acid protease (hemicellulase). 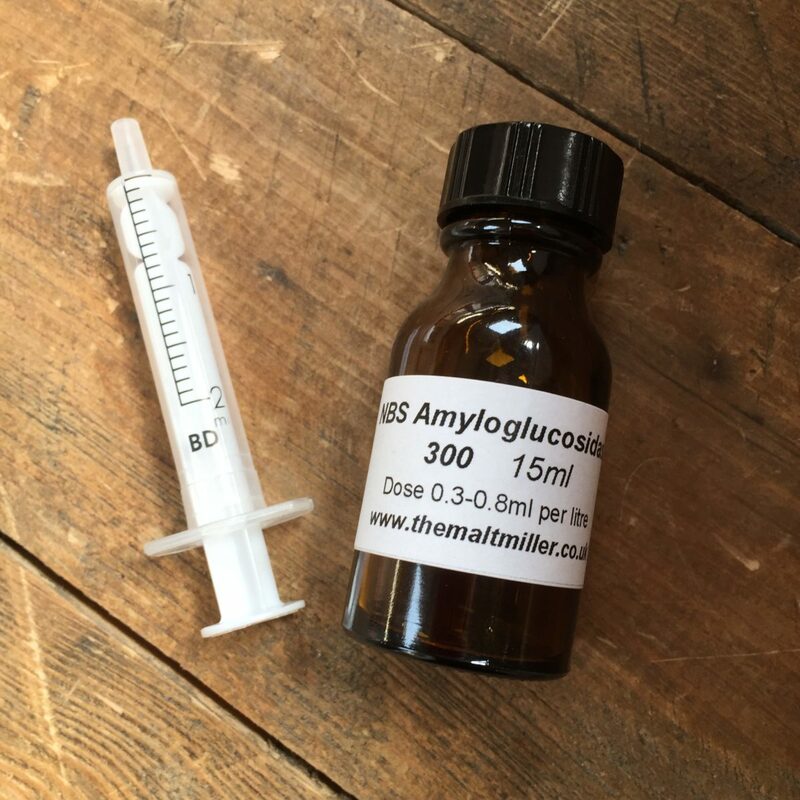 Amyloglucosidase 300 can be added to the kettle or fermenter to create low carbohydrate super-attenuated beers. Alternatively, it can be added to the mash converter to improve fermentability or to change the sugar spectrum of the resultant wort. Another use for the enzyme is the replacement of priming sugar additions to bottled beers. Glucose is produced from oligosaccharides giving rise to an increase in perceived dry/sweetness character. To mash conversion vessel, fermenter, or post-fermentation, depending on application. The pH range for the activity of the product is between 3.0 and 5.0, with optimum performance at pH 4.2. The optimum pH will depend upon process variables, including time, temperature, substrate nature and concentration. The enzymic activity of the product is effective in the temperature range between 40°C and 65°C, with optimum performance at 60°C. The optimum temperature will depend upon process variables including time, pH, substrate nature and concentration. The product can be inactivated by holding at a pH of between 4.0 and 5.0 for 10 minutes at a temperature of 95°C or for be-tween 30 and 60 seconds at a temperature of 80°C. For the production of low carbohydrate beers, typical rates of addition are between 0.03ml and 0.08ml g per litre of wort; dependent upon temperature, time, desired attenuation and sugar spectrum. The activity of Amyloglucosidase 300 is expressed as GAU/ml. one GAU produces 1 gram of reducing sugars per hour from 4% soluble starch, under assay conditions of pH 4.2, and a temperature of 60°C for 60 minutes. May cause allergy or asthma symptoms or breathing difficulties if inhaled. Avoid breathing gas/mist/spray. Use in well ventilated space or wear respiratory protection. Took my brut IPA down from 1.060 to 0.997. Yet to taste it, but expecting it to be very dry! Shame the syringe is too big for the bottle. Sorry, we must have sent the wrong syringe as we have a range for different size doses and bottles.